Daphne Brogdon decides it's time for the family to unplug and spend time together without any technology, so it's off to the backyard for an impromptu camping trip and dinner. On the menu, Grilled Split Hot Dogs on butter-toasted buns with three tasty toppings to choose from: Creamy Avocado Relish, Sweet Mustard Sauce and Buttermilk Ranch Slaw. Then a healthy side dish the kids love, Yellow Ears and Black Eyes Succotash, and a hearty Fireside Potato Salad. And finally, Daphne's S'mores Bars are a crunchy, creamy and sweet twist on a classic. 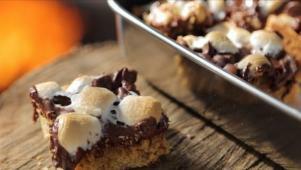 Daphne prepares S'mores Bars that are easy to make and create less mess.